↑ Burnett, B. (2006, December 21). James Brown: Audience with the Godfather Arquivado em 16 de novembro de 2009, no Wayback Machine. (interview). The Hour. Retrieved January 9, 2007. ↑ a b Martin, J. (January 4, 2007). Tomi Rae defends her relationship with James Brown. Arquivado em 2013-01-05 no Archive.is WRDW-TV (Augusta, Georgia). Retrieved January 9, 2007. ↑ Gardner,L. (December 26, 2006). Tomi Rae Hynie: "It's a blatant lie". Arquivado em 2016-05-23 no Arquivo Web Português WRDW-TV (Augusta, Georgia). Retrieved January 8, 2007. ↑ a b c Smith, W. (December 26, 2006). 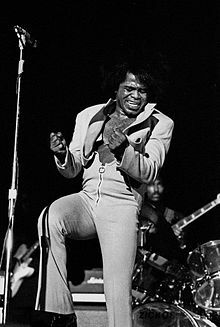 James Brown, the undeniable Godfather of Soul" dead at 73. [ligação inativa] The New York Beacon. Retrieved January 10, 2007. ↑ Crowl, D. (2002, June 29). The godfather's bridge: James Brown snatched a piece of steamboat history nine years ago. Arquivado em 13 de novembro de 2007, no Wayback Machine. Steamboat Pilot & Today. Retrieved January 12, 2007. Esta página foi editada pela última vez às 18h27min de 24 de abril de 2019.